Last Friday night David and I heard a fabulous concert by the Finnish band Värttinä. They have a unique and fascinating sound and they put on a great show. 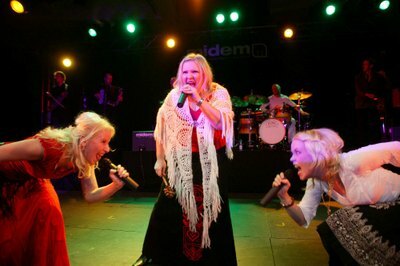 Värttinä includes an acoustic folk band - fiddle, bouzouki, accordion, and other instruments - fronted by three powerful, energetic singers. Their music draws on Finnish folk sounds and lyric poetry, but the sound is decidedly contemporary. To put it concisely, Värttinä rocks. The pulse of Värttinä is its astonishing drummer, Jaako Lukkarinen. At about the halfway point in the show, as a song was concluding, David turned to me and said, "That drummer is from another planet." Moments later the band exited the stage to take a break - all except Lukkarinen, who treated us to the most fascinating and far-ranging 15-minute drum solo one can imagine. He started by drawing a drumstick along the edge of his cymbals, using it like a bow to set up the most eerie wailing vibrations. He created crisp rhythms with strings of shells. And, eventually, he just plain hit the crap out of the drums in a driving rock-and-roll beat. But if Lukkarinen is the band's pulse, its soul is shaped by the clever, folksy style of its singers, Susan Aho, Johanna Virtanen, and founding member and anchor Mari Kaasinen. They writhe and stomp as they act out the themes of their lyrics - everything from the enchantments of forest witches to what it feels like to be unable to get to sleep at the end of a long day. They create tight, close harmonies and impossibly complex rhythms, all while putting on a show that is engaging, fun, and delightful. It was simply a great show. I only have one Värttinä album, a 15-year old endeavor called Seleniko. That was much more of folksy album - it didn't rock the way they did on Friday night. So I'm going to have to pick up something more recent - something after Lukkarinen joined the band. Oh, and Värttinä have also collaborated with one of my favorite Bollywood composers, A.R. Rahman, on a giant musical production of Lord of the Rings set to open in London this spring. I am looking forward to hearing the music from that - A.R. Rahman is a master of fusion, and I can't even imagine what he could do with sounds like Värttinä's.